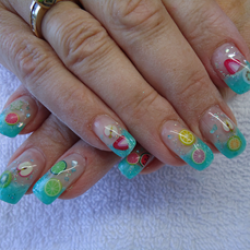 We have drawers of nail colours and designs, and we'll personalize your nails to put a smile on your face. Ladybug uses En Vogue Gel Resin for all enhancements. EnVogue is orderless, flexible, non-porous, non-yellowing, and has a lighter feel and a more natural look than traditional acrylics, providing greater performance, look and feel.